↑ Albonico, Marco; Allen, Henrietta; Chitsulo, Lester; Engels, Dirk; Gabrielli, Albis-Francesco; Savioli, Lorenzo; Brooker, Simon (2008). "Controlling Soil-Transmitted Helminthiasis in Pre-School-Age Children through Preventive Chemotherapy". 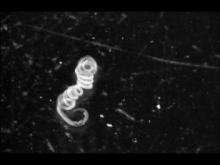 PLoS Neglected Tropical Diseases. 2 (3): e126. doi:10.1371/journal.pntd.0000126. PMC 2274864 . PMID 18365031. ↑ Taylor-Robinson, DC; Maayan, N; Soares-Weiser, K; Donegan, S; Garner, P (23 July 2015). "Deworming drugs for soil-transmitted intestinal worms in children: effects on nutritional indicators, haemoglobin, and school performance.". The Cochrane database of systematic reviews. 7: CD000371. doi:10.1002/14651858.CD000371.pub6. PMID 26202783. ↑ "Helminth control in school-age children" (PDF). World Health Organisation. 2011. Retrieved 28 July 2015. ↑ Hagel I, Giusti T (October 2010). "Ascaris lumbricoides: an overview of therapeutic targets". Infect Disord Drug Targets. 10 (5): 349–67. doi:10.2174/187152610793180876. PMID 20701574. new anthelmintic alternatives such as tribendimidine and Nitazoxanide have proved to be safe and effective against A. lumbricoides and other soil-transmitted helminthiases in human trials. ↑ Shoff WH (5 October 2015). Chandrasekar PH, Talavera F, King JW, eds. "Cyclospora Medication". Medscape. WebMD. Retrieved 11 January 2016. Nitazoxanide, a 5-nitrothiazole derivative with broad-spectrum activity against helminths and protozoans, has been shown to be effective against C cayetanensis, with an efficacy 87% by the third dose (first, 71%; second 75%). Three percent of patients had minor side effects. ↑ Levecke, Bruno; Montresor, Antonio; Albonico, Marco; Ame, Shaali M.; Behnke, Jerzy M.; Bethony, Jeffrey M.; Noumedem, Calvine D.; Engels, Dirk; Guillard, Bertrand; Kotze, Andrew C.; Krolewiecki, Alejandro J.; McCarthy, James S.; Mekonnen, Zeleke; Periago, Maria V.; Sopheak, Hem; Tchuem-Tchuenté, Louis-Albert; Duong, Tran Thanh; Huong, Nguyen Thu; Zeynudin, Ahmed; Vercruysse, Jozef; Olliaro, Piero L. (9 October 2014). "Assessment of Anthelmintic Efficacy of Mebendazole in School Children in Six Countries Where Soil-Transmitted Helminths Are Endemic". PLoS Neglected Tropical Diseases. 8 (10): e3204. doi:10.1371/journal.pntd.0003204.